"The Lovesickness of Frey" (1908) by W.G. Collingwood. Question 2: When ________ was writing in 13th century Iceland the indigenous Germanic gods were still remembered though they had not been openly worshiped for more than two centuries. 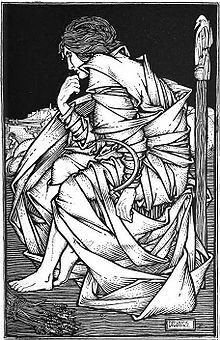 Question 3: The protagonist of ________ is a priest of Freyr. Question 4: In the Icelandic books the Poetic Edda and the Prose Edda, Freyr is presented as one of the Vanir, the son of the sea god Njörðr, brother of the goddess ________. Question 5: The 14th century Icelandic Ögmundar þáttr dytts contains a tradition of how Freyr was transported in a wagon and administered by a priestess, in ________. 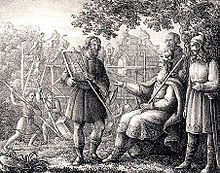 Question 6: No myths involving Skíðblaðnir have come down to us but Snorri relates that Freyr rode to ________'s funeral in a wagon pulled by Gullinbursti. 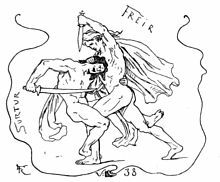 Question 7: Njördr in Nóatún begot afterward two children: the son was called Freyr, and the daughter ________; they were fair of face and mighty. Question 9: Such a memory may also be the source of a description in book 6 of the stay of ________, a follower of Odin, in Sweden.